Photo: Linsay House, ca. 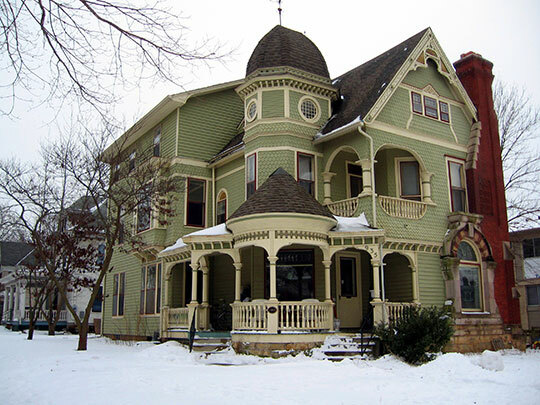 1893, 935 East College Street, Iowa City, IA. Listed on the National Register of Historic Places in 1977. Photographed by user:Bill Whittaker (own work), 2008, [cc-by-3.0 (creativecommons.org/licenses/by/3.0)], via Wikimedia Commons, accessed December, 2013. The Johnson County Administrative Offices are located at 913 South Dubuque Street, Iowa City IA 52240; phone: 319-356-6000. The county was named for Richard Mentor Johnson, ninth U.S. Vice President (1837-1841) under Martin Van Buren. Prior to that he represented Kentucky in the U. S. House of Representatives (1807-1819) and the U. S. Senate (1819-1829). The county was first organized in 1837 by the Wisconsin Territorial Legislature, prior to Iowa's becoming a state. Napoleon, a few miles south of the 'future' Iowa City, was designated county seat. Iowa City was created by legislative act in 1839. Upon becoming the 29th state in 1846, Iowa City served as its capitol until it was moved to Des Moines by 1857. History of Johnson County, Iowa, Containing a History of the County and its Townships, Cities and Villages from 1836 to 1882, Iowa City, IA, 1893.